I found the original recipe for these on McDougall's website, changed a few things, and this is the end result. We're always up for brownies! Mix blended prunes and sugar together in a separate bowl. Mix egg replacer and water together and whisk until frothy. Add to sugar mixture and stir to combine. Add wet ingredients to dry and stir just until mixed. Try not to eat all the batter. Spoon into a lightly greased 9x13 pan or two 8x8 square pans. *The walnuts in this are great- I just have to chop mine up super tiny so they disappear, otherwise my family rebels. *To make the prune mix, put 3 cups of water in the blender and add 1 to 1.5 cups of dried prunes until the water hits the 4 cup mark. Blend until smooth. Use 2 cups for the recipe, and then you can freeze the extra or just put it in the fridge to use later. It's a great fat replacer! You can also just buy baby food prunes, but when you are using 2 cups you'd have to buy 8 because they come in 1/4 c. containers. yum! what sugar do you use, lize? In this recipe I use the organic sugar that is really evaporated cane juice. I might try it with sucanat some time. i made these yesterday. i used 1/2 c. evaporated can juice, 1/2 c. sucanot, and 1/4 t. stevia. they were great! 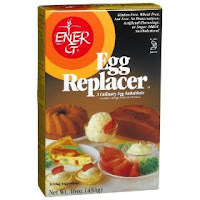 I tried brownies with the egg replacer before and it didn't work - it was more like pudding. I'll have to try this recipe . . . THANKS! I try not to do anything processed. That is not to say I am 100% processed food free. But I use ground flax seeds and tofu in replacement of eggs. I don't even miss the little ovums.